Really, you can never own enough muffin recipes! So quick to whip up, so many varieties, so easy to pack for cold lunches, picnics, hiking trips, vacations, let alone use for any meal of the day and then snacks in between. They freeze like a dream; they taste even better. So, really, you can never own enough recipes. I hope you enjoy the ones featured this month, and then I hope you'll hunt around for some other recipes that are hiding out in your cookbooks, on your Cook'n CDs, in DVO's recipe archives, or in your Grandma's recipe box. Muffins come in so many varieties that you could serve a different version everyday and still not get to all the scrumptious, tantalizing recipes available. They're just too fun, so bake up some old-fashioned goodness tonight. Your family will love you! For muffin hints, tips, and tricks, read on. Otherwise print off some recipes and head to your kitchen for a muffin party. Oh, Do You Know the Muffin Method? If you took Home Ec. in high school instead of Shop (or as it is termed today "Industrial Arts"), then you probably learned the muffin method. Of course, if you did take Shop, do any of you still own the NFL football clocks or the wooden belt buckles or the boldly painted ceramic decorations you made Mom for Mother's Day? Probably the more pertinent question for those in the Home Ec. class is, "Do you remember the muffin method?" When it comes to mixing muffins, you don't need to remember much. However, you do need to know how to prevent your cute little mushroom breads from turning into tunneled, peaked, crumbly flops, and that's where the muffin method comes into play. Beyond my high school home economics class, I learned there are actually two methods for mixing up scrumptious muffins. So without further ado, let's look at these two! 1. Mix the dry ingredients together (flour, leavening, salt, sugar, grains, etc.) Sometimes you'll add the fruit or nuts to this mixture too. When the add-ins attain their white coat of flour, they'll be evenly disbursed throughout each instead of sinking to the bottom of your muffins. 2. Blend the wet ingredients together in a separate bowl (milk, water, honey, eggs, oil, extracts, purees, etc.) 3. Form a well in the center of the dry ingredients and pour the wet mixture into it. 4. Gently fold the dry ingredients into the moist ones just until moistened. Batter is usually lumpy. 5. Scoop batter into prepared muffin tins, add any toppings, and bake at once. 1. Cream the butter and sugar until lightly and fluffy. Room temperature butter will cream up fluffier than cold butter. 2. Add the eggs, one at a time, beating after each addition. 3. Combine the dry ingredients in a separate bowl to evenly distribute the leavening. 4. Gradually add the dry ingredients to the egg mixture, alternating with flavorings, and any liquid. 5. Beat the batter just until smooth. 6. Scoop batter into prepared muffin tins, add any toppings, and bake at once. Mini to Jumbo Do you prefer the pop-in -the -mouth mini's or the salad-plate sized jumbos? Truly, they all taste the same, but they don't bake the same. The mini-muffin pan holds about 2 tablespoons batter per cup. A standard muffin pan uses about 1/2 cup of batter, while the papa bear of muffin tins can hold up to one cup of batter. You can use any muffin recipe with any of these pan sizes. The only fine-tuning needed is on the baking time. Obviously, the smaller the muffin, the quicker it bakes. Expect then, a 5-7 minute decrease from the standard muffin baking time when cooking up minis. Likewise, add an additional 8-12 minutes to the standard muffin time when baking jumbos! Digging 'em out! If you've ever had to pry muffins from your tins, you know how discouraging it is to watch your lovely breads crack and crumble onto the countertop. Next time grease those pans well on both the sides and bottom. Nonstick cooking spray works delightfully. You can even spray your paper liners if you find that too much of the muffin is peeling away with the paper. Paper liners keep muffins fresh longer. They peel off easier on muffins served at room temperature rather than warm from the oven. For mini-muffins, use the paper cups used in candy making. Or better yet, try the newest technology in baking, Silicone Bakeware! These pans are made of flexible silicone, so you can just twist and pop the muffins right out. Click here to see more details. Space for Rent If you run out of batter before you finish filling all the cups available on your muffin tin, pour some water (about 1/3 full) into the empty cups. The water will keep your pan from buckling in the oven and will also keep it from scorching. When dishing out the dough, place an even amount of batter in each cup. This will ensure that your muffins will be done cooking at the same time. Various sized spring-lever scoops work great for spooning up the batter evenly, but dry measuring cups or spoons also work. Fill the cups 2/3 full. You can fill the cups evenly with the rim for nicely shaped, larger muffins, if you wish. Just be sure to grease the entire muffin tin, to keep the tops of the muffins from sticking to the area around each cup. 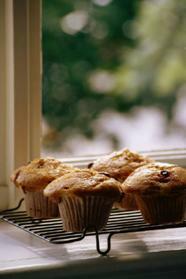 Overfilling the cups leads to spills in your oven, but underfilling equals muffins with flat-tops instead of hill-tops. Cool it! Tempting as it is to torture your tongue with a fresh-from-the-oven muffin, resist the potential of a blistered tongue by letting the muffins sit in the pan for 5 minutes. As the heat scatters, it adds moisture back into the muffin and sets the muffin's texture. After sitting a spell, turn out the muffins onto a cooling rack to finish cooling. If left in the pan, muffins may be extremely difficult to remove and/or their bottoms may get soggy from too much moisture absorption. In a Minute Muffins in the morning or muffins at midnight? Both will always be a possibility if you mix up a batch of muffins for storage. They'll store for up to 3 months in the freezer, a week at room temperature, or about 4+ days in the refrigerator. When ready to snack, thaw muffins on the counter for about a half-hour, or pop them into the microwave for a few seconds. If microwaving isn't an option, but you long for that muffin from the oven warmth, place muffins into a 300 F. oven for 5-8 minutes. Here's another alternative to quick, nutritious breakfasts. You can actually freeze the muffin batter. Simply dish the batter into foil-cups in your muffin tin, quick-freeze, and then store them in a freezer bag labeled with the baking information. When ready to bake, return the muffin cups to the tin and bake as directed by the recipe, adding about 10 more minutes baking time. If you wish, you can keep batter in the refrigerator too for up to 5 days. This works best for batters made with double-acting baking powder, not for ones made with baking soda. Still, the longer muffin batter sits, the more the baked muffins decrease in volume. You'll probably like the results better if you use refrigerated batter within 24 hours.